Boost your preparation by practicing & taking mock tests based on latest exam pattern. Practice like never before with MyProgressCard, grab a chance to do unlimited practice test series for your SBI JUNIOR ASSOCIATES 2018 exam. Identify your strength and weak areas, analyze your performance and improve accordingly. Within few steps, you can take practice test on your choice of subjects/concepts and get detailed feedback/analysis instantly. MPC gives a review on your Attempted Questions, Correctly Answered, Secured Marks and Overall Score. Realtime exam scenario Mock Tests awaits you to enhance your SBI JUNIOR ASSOCIATES 2018 preparation. MyProgressCard allows you to take online Mock Test series at a convenience of your free time on your smart device or pc. Full-length mock tests gets you access to all important questions, bringing the results of your performance. Just few clicks away to take Mock Tests that will boost your speed and accuracy in actual exam. To score top in SBI JUNIOR ASSOCIATES exam, it needs practicing right type of questions that covers latest exam syllabus & pattern. MyProgressCard comes with large sorted in-built question bank, which covers nearly 1 Lakh+ Questions ranging over SBI JUNIOR ASSOCIATES exam. 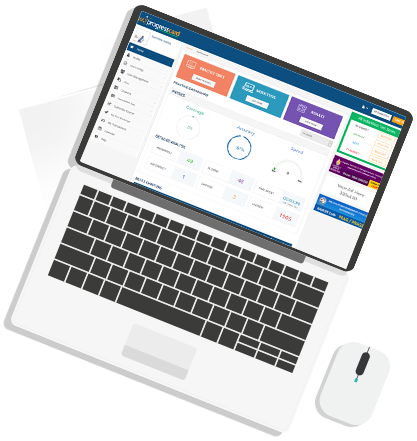 MyProgressCard’s question bank is designed and developed by educational experts, who acquire great entrance exam knowledge and completely familiar with latest examination trends. 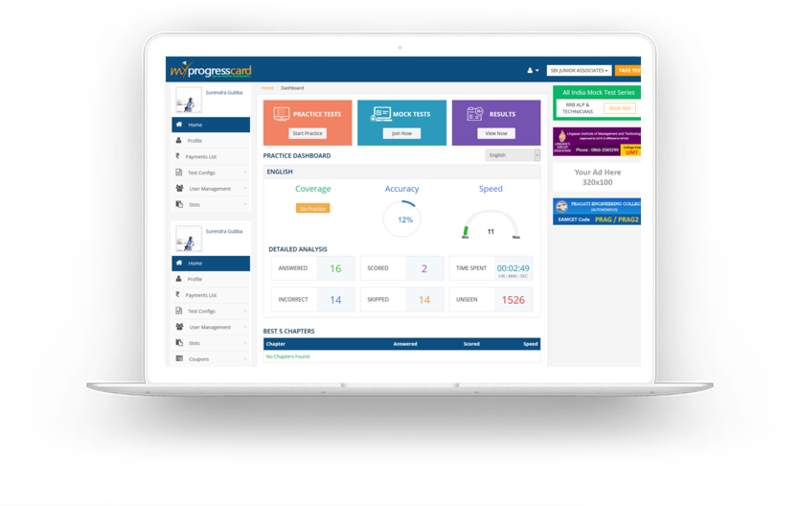 MyProgressCard gives you a detailed feedback & analysis once the test is completed, letting you to know your strengths & weaknesses. Especially, the graphical representation view on subject-wise & concept-wise is configured really well. One can plan and fine-tune his/her preparation by working on those weak areas after reviewing performance. 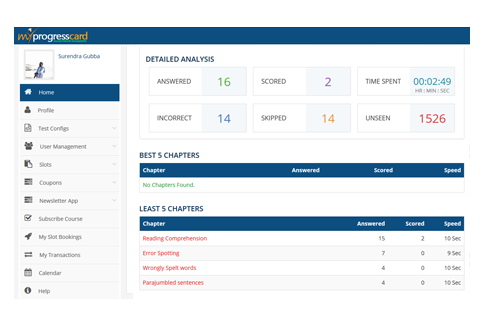 Insightful analytics of MyProgressCard also gives subject overview percentage, including overall attempts, correctly answered questions & secured score. 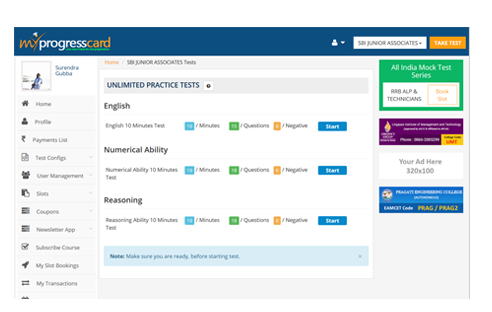 Get started to redefine your aspiring exam ‘SBI JUNIOR ASSOCIATES 2018’ exam preparation with MyProgressCard Practice & Test series. Thanks myprogresscard! It helped me in my betterment of quantitative aptitude and reasoning ability for my SBI Jr Associates exam. MyProgressCard test series covered latest syllabus and exam pattern which is best suitable for SBI JUNIOR ASSOCIATES exam 2018.